As a successful healthcare executive, Fred Goad of Brentwood, Tennessee had access to the best healthcare resources around the country. However, after countless visits and treatment methods, the circulation condition in his legs worsened, and he was told by multiple physicians that amputation was his only option. At 76 years old, Fred reluctantly started planning his future by making prosthetic appointments, speaking with other amputees, and converting his home into an amputation-friendly environment. Then he heard about Dr. Craig Walker at Cardiovascular Institute of the South. 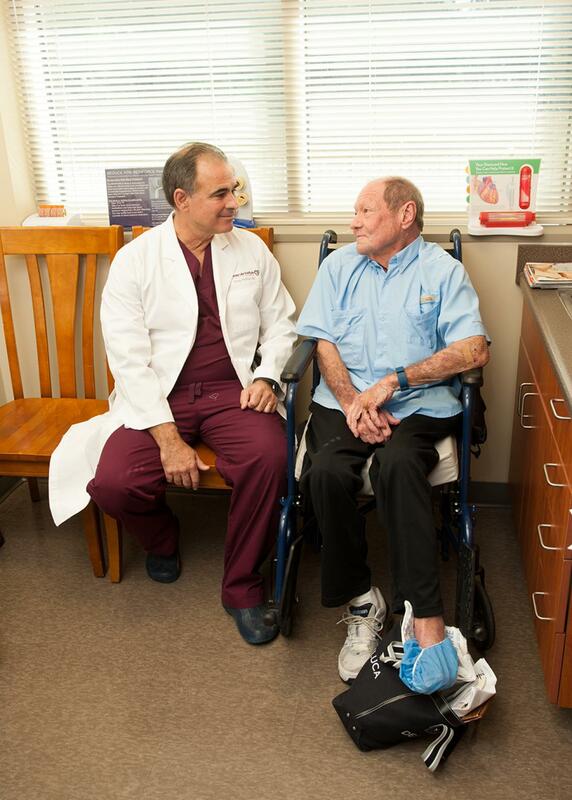 After a phone conversation with Dr. Walker, Fred Goad traveled to Houma, Louisiana, hopeful that this last resort would be the one to save his leg, and ultimately, his quality of life. 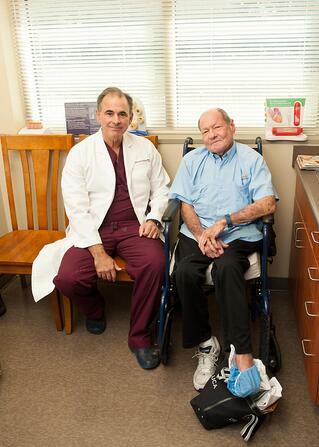 Fred Goad, 76, of Brentwood, Tennessee did not mind driving 10 hours to see Dr. Craig Walker—because that trip saved his leg and ultimately, his quality of life. Goad has more than 40 years of experience in managing and growing healthcare companies, founding Voyent Partners, LLC and serving as co-chief executive officer of the transaction services division of the WebMD Corporation. In April of 2016, he noticed a wound on his left foot. He visited a podiatrist, who removed some of the dead skin and tissue, but the wound would not heal. Goad then sought out the help of a vascular physician and received a Doppler test, an ultrasound which determined a lack of blood flow in his leg. Goad learned that he was suffering from peripheral arterial disease caused by plaque build-up or blockages in the legs. Just like clogged arteries in the heart, blocked arteries in the legs keep the organs from receiving oxygen-rich blood, which raises the risk of cardiovascular events, such as heart attacks and strokes. One in 20 Americans over the age of 50 have PAD, and though it is a common and treatable disease, it is largely unknown, often unrecognized, and its symptoms are commonly attributed to old age. Ultimately, PAD can reduce mobility and be fatal if left untreated. Those at risk include anyone over the age of 50, especially African Americans; those who smoke or have smoked; and those who have diabetes, high blood pressure, high blood cholesterol or a personal or family history of vascular disease, heart attack, or stroke. “The most severe manifestation of this disease is critical limb ischemia which is the leading cause of major amputations throughout the world,” explained Dr. Walker. Surprisingly, Goad does not suffer from heart disease or diabetes. “I hadn’t even heard of PAD until 6 months ago,” he added. Per his doctor’s recommendation, Goad began using an at-home arterial assist device designed to increase blood flow without surgery and open collateral arteries. For nearly three months, Goad used this treatment method three hours a day, for one hour at a time. After no improvement, Goad had an angioplasty with the hopes of opening blood flow, but a balloon was not able to open the blockage. Another Doppler test showed that the problem was only getting worse, and so much so, that he needed to stop using the at-home assist device. Running out of options to heal his wound, Goad tried using hyperbaric oxygen therapy to promote re-circulation, reduce swelling, and speed up wound healing. Performed in a pressurized chamber, hyperbaric oxygen therapy typically involves two-hour sessions of breathing 100 percent oxygen. Goad did the maximum number of treatments—40—without the result that he was hoping for. In August, he visited a nationally-renowned health system for an angioplasty to again try to open the occlusion, but with no avail. Goad began preparing for what he felt was an inevitable amputation. “We were planning home renovations, looking into prosthetic options, and discussing specifics with amputation specialists,” he said. In talking with a former colleague and physician, Goad was told about a cardiologist in Houma, Louisiana who is known for preventing amputations. His friend had heard about Dr. Craig Walker and had previously referred another acquaintance to him as well. “I decided to go to Houma to see if Dr. Walker could do a ‘Hail Mary’ and save my leg!” Goad said. On September 7, Goad traveled to Houma, Louisiana to visit Dr. Craig Walker, founder, president and medical director of Cardiovascular Institute of the South (CIS). After a series of tests, Dr. Walker explained his plan to open the 18-inch occlusion—a series of three stents in two of the arteries. If you think you may have PAD, a simple, painless ultrasound can test the blood flow in your legs to determine your risk. Learn more about PAD here.